Turkish President Tayyip Erdogan's visit to Greece was supposed to be historic, because it was the first by a Turkish president in 65 years. If it is to be remembered, it is likely that it will be for a public spat between Erdogan and his Greek counterpart, Prokopis Pavlopoulos, over a 94-year-old treaty. "I don't think the meeting will stand up to history," says Haralambos Tsardanidis, head of the Institute of International Economic Relations. "The meeting between the presidents rather poisoned the relationship." In an interview televised in Greece the night before Erdogan's visit, he set the agenda. Erdogan expressed the wish to "update" the 1923 Lausanne Treaty, which fixed the border between Greece and Turkey and provided for protections of minority rights and customs in both countries. 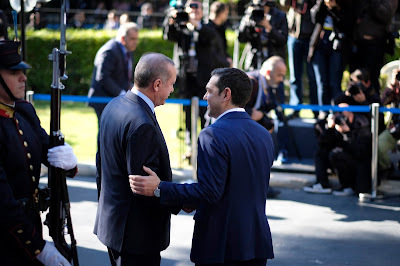 Greece is against any revision of the treaty, and Pavlopoulos, a constitutional law professor, told Erdogan on it as soon as they met, calling it "non-negotiable". "It has no gaps. It needs neither revision nor updating. It stands as it is, it covers absolutely the issues that it needs to cover, and stresses that among other things it leaves no leeway for grey zones or minority issues," Pavlopoulos said. Erdogan replied: "In Western Thrace they can't even stand the word Turkish. They abhor seeing it on a school sign or a club. We need to get past this. When I talk about updating, this is exactly what I mean." Erdogan said he would like the Muslim community in Thrace to be called Turkish, to be free to elect its head mufti [who is currently state-appointed] and to enjoy a higher standard of living. Greek observers were surprised. "I must say, I've never seen a substantive negotiation take place in front of the cameras," commented Yiorgos Koumoutsakos, Greece's conservative shadow foreign minister. Conservatives on the street were happy, however. "I think Pavlopoulos has scaled the pinnacle of his political career," said right-wing radio commentator Yiorgos Trangas. Nor did the atmosphere greatly improve when Erdogan met Alexis Tsipras, the Greek prime minister. During their discussions, they sparred over the ongoing division of Cyprus, whose northern third has been occupied by Turkish troops since a 1974 invasion. Erdogan blamed the Greek side for two failed rounds of talks to reunify the island in 2004 and this year. "The Greek Cypriot side wanted to walk out of talks and I said, 'No, we will sign an agreement.' In the referendum that followed, 60 percent of the Turkish-Cypriots accepted the Plan but 60 percent of Greek-Cypriots rejected it. The Greek Cypriots promised us that we would solve the Cyprus problem but that's not what happened. Recently we met again in Switzerland but who walked out? The Greek-Cypriot side again." Tsipras responded: "I am 43 years old, and for 43 years Cyprus has been an ongoing issue ... this issue remains open because 43 years ago there was an illegal invasion and occupation of the northern section of Cyprus." Bilkent University's Ioannis Grigoriadis blames the Greek side for what he calls a "derailment". “I don’t think Erdogan intended to cause problems during his visit, but since the Greek president put things to him in public he felt obliged to respond,” says Grigoriadis, a political science professor at Bilkent University. Presenting Turkey as the protector of Muslim minorities in the Balkans is a standard Turkish foreign policy position, and Grigoriadis believes Erdogan would have mentioned the Muslim minority in Greece anyway, but in a less acrimonious way. "He wanted to appeal to his right wing. That's his base, and he’s afraid of losing part of it to the MHP-splinter ‘Good Party’ that has been recently founded,” Grigoriadis says. Erdogan was elected to the presidency in 2014 with a sliver of a majority - 52 percent - and he failed to carry Turkey's largest cities - Istanbul, Izmir and the capital, Ankara, in an April 16 referendum granting the presidency increased powers. Falling international confidence in the Turkish economy is reflected in the Turkish lira, which has dropped to 26 cents on the dollar, from almost 60 cents four years ago. Some of that confidence gap stems from the increasing isolation of Turkey, since a July 2016 attempt by military officers to unseat Erdogan. The Greeks sought this meeting partly because it was an opportunity for Greece to act as a mediator between Europe and Turkey. Since then, Turkey’s state of emergency has distanced Erdogan from European leaders even further. Greece’s invitation to Erdogan is only the second from an EU country since the coup. Greece is also alarmed by the rise in refugees arriving across the water from Turkey, from an average of 50 a day in the spring to four times that number. That rise has come with renewed tension in the Aegean - some 3,000 airspace violations by Turkish fighter aircraft this year, marking a five-year peak. In a statement last month, Foreign Minister Nikos Kotzias said that “the danger of an accident in the Aegean is on the rise,” as Greek fighter jets take off to meet Turkish ones. And Greece says territorial water violations number 1,600 this year, a ten-year high. In this area of security, the two sides may have achieved something, believes Tsardanidis. "What was salvaged was that the two sides agreed to talk about confidence-building measures and [delineating] the continental shelf. Both are important to the Greeks because they can lower tensions in the Aegean," he says. However, he cautions against over-optimism. "It's open to question whether the climate that was created will allow for progress, because there are people in Greece and Turkey who don't want to see a substantial negotiation between Greece and Turkey, and they are very uncompromising."